I have a serious case of startitis. I also keep finding old projects laying around that suddenly seem very intriguing. I have a ton if WIPs right now and honestly, I love it! I love having them all in one pile/bag/place. I can look in the bag and say, “Hmmm….what should I work on today?” It’s very soothing to have the options and to knit/crochet on the couch, with the boys running around and fall outside my window. A cup of coffee and I am set. I’m going to post one a day, for funsies. I love checking projecty blogs every day, don’t you? Oh the pretties! It is Schoppel Wolle Zauberball, watermelon (” Durch die blume”) color. I use size 2 needles, double circulars. The ones pictures are Addi needles. I. Love. Them. 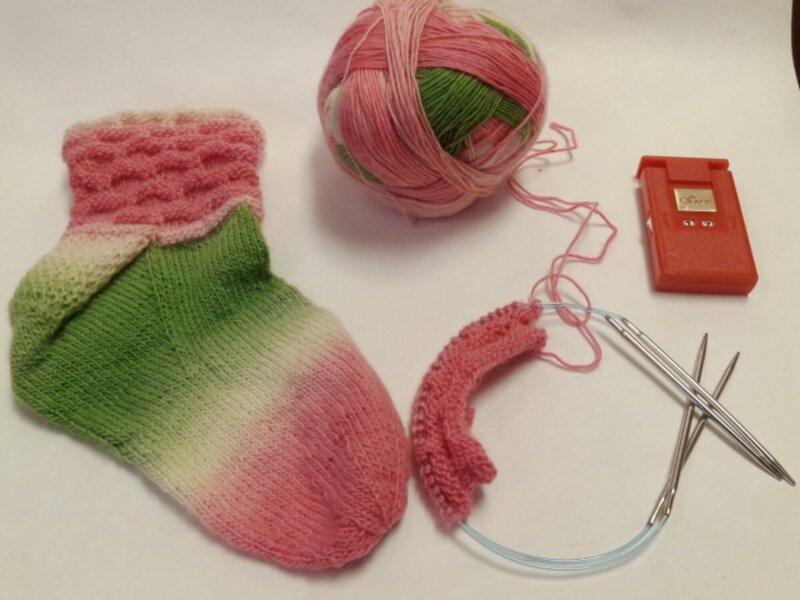 Pattern is Circle Socks by Anne Campbell; I found her on ravelery. This pattern is easy and really fun to watch take shape. I love the heel! 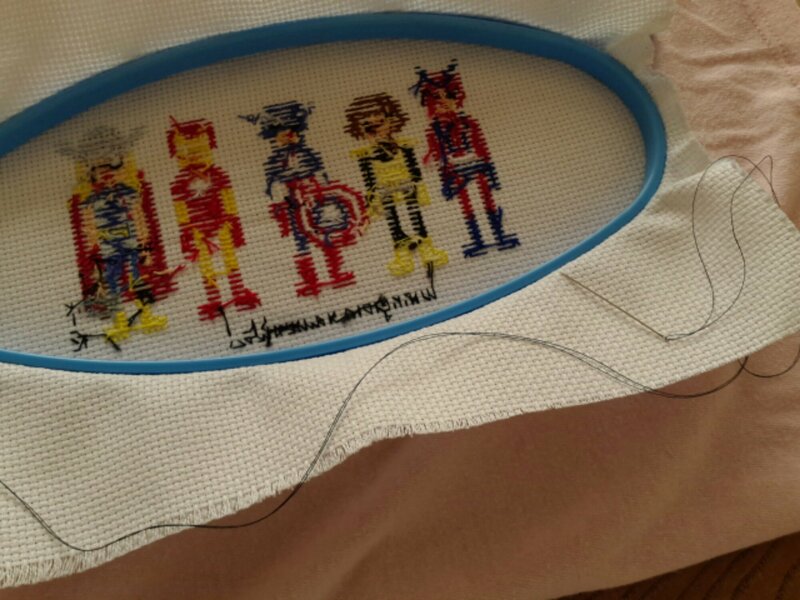 This is a fun one to work on during a movie since the pattern is so easy to remember. I love double circs for socks because I don’t have to fumble with double points or magic loops. I don’t know, double circs and I just click! Zauberball is amazing. The color gradient is ridiculously cool! I have another sock in the works with this brand, too, ugh! So pretty! I thought I’d share how to frame a cute little stitch. As you know, I’m hooked on Wee little Stitches, and most of their stuff is small. Hence, easy to carry around, finish in a decent amount of time, etc. But what do I do with all those stitches I’ve done? Framing those things professionally would be way too expensive. 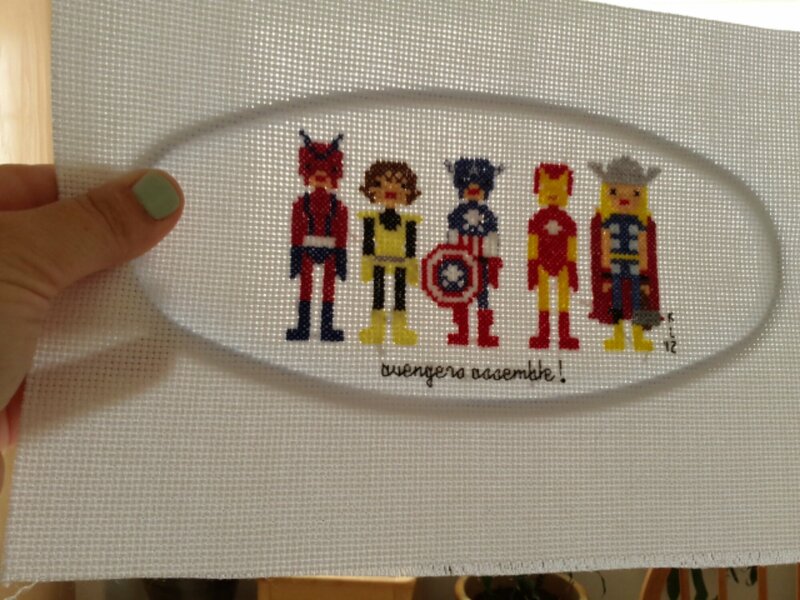 I found the hoop section at the craft store and brought along my stitches to frame. I picked out the ones that looked nice. Each frame is anywhere from $1-4. I chose some bright plastic ones because these projects are going in my sons’ room, but the wood ones look nice too. 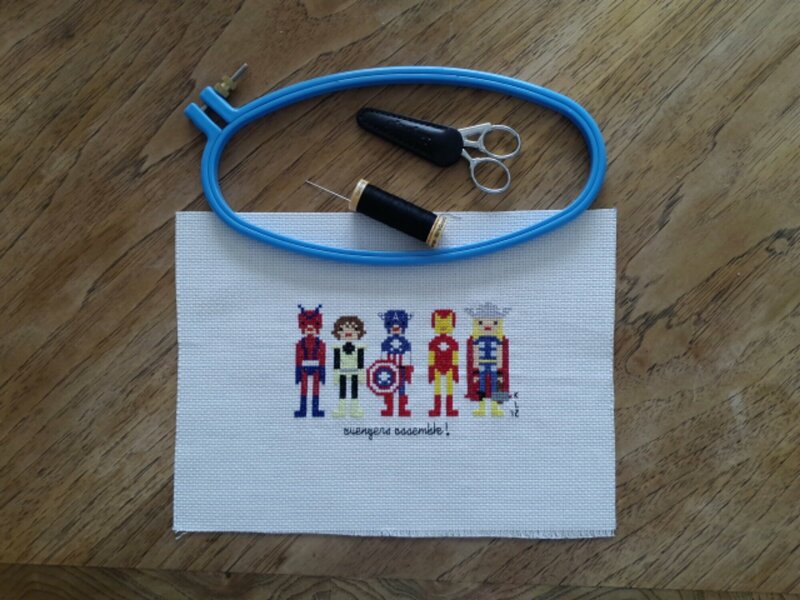 The finished, ironed piece, scissors, good thread, and a hoop. I also use a scrap piece of fabric but you’ll see that in a minute. 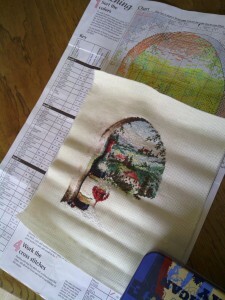 Take the hoop apart and line up the back piece behind the stitching-a window helps here. You can adjust it later so right now just get it mostly in place. 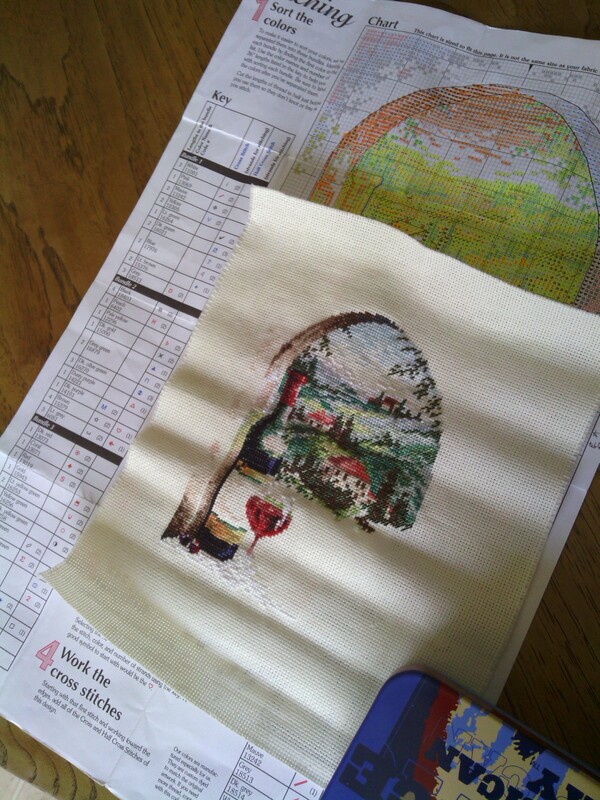 Now place it on a clean surface, or that cloth, and out the top piece on. I love the plastic hoops for framing because they really hug the fabric and hold it in place. Get the piece about where it needs to be, tighten the top hoop a little, then gently tug the fabric around until it is centered. This takes a while sometimes, but be patient. No worries. Don’t get too OCD about it or you’ll throw something. Not that I….throw things…ahem. Now here is the finishing part. 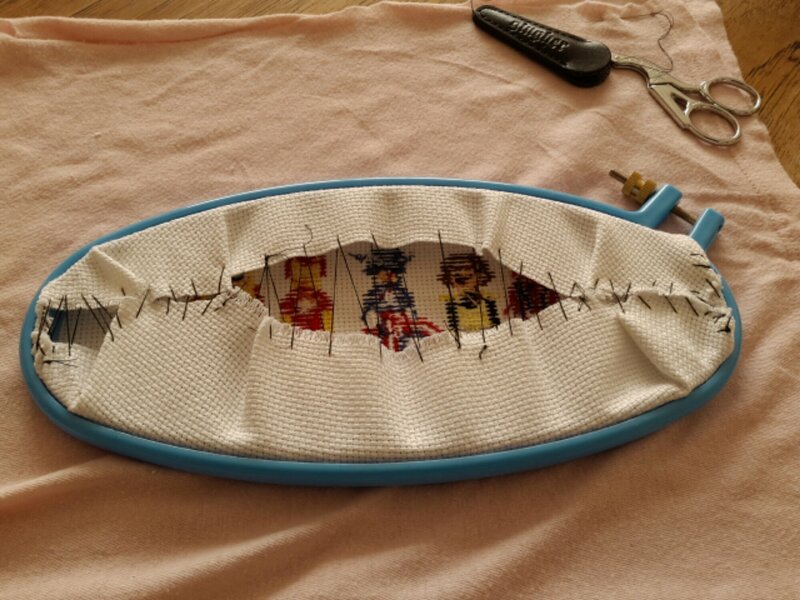 Make sure that hoop is on tight as you can (don’t resort to pliers or anything just use your mad sewing finger strength or the plastic may break and things will get thrown) and flip the piece over. I use a scrap from an old t-shirt. Pull off a fair length of thread, thread the needle, and pull both end of the thread together and knot the end. Knots are your friend here; the back will face the wall anyway so do not fear the knots! Gently fold the fabric towards the center of the hoop and start sewing the opposite ends together. Pull fairly tightly, but don’t break the thread. Tone down your mad sewing finger strength for this. You can tighten it later. Go in a zig zag fashion across the back. (I re-threaded two or three times and only broke the thread once-no problem) You may have to trim the fabric a bit to make it easier. 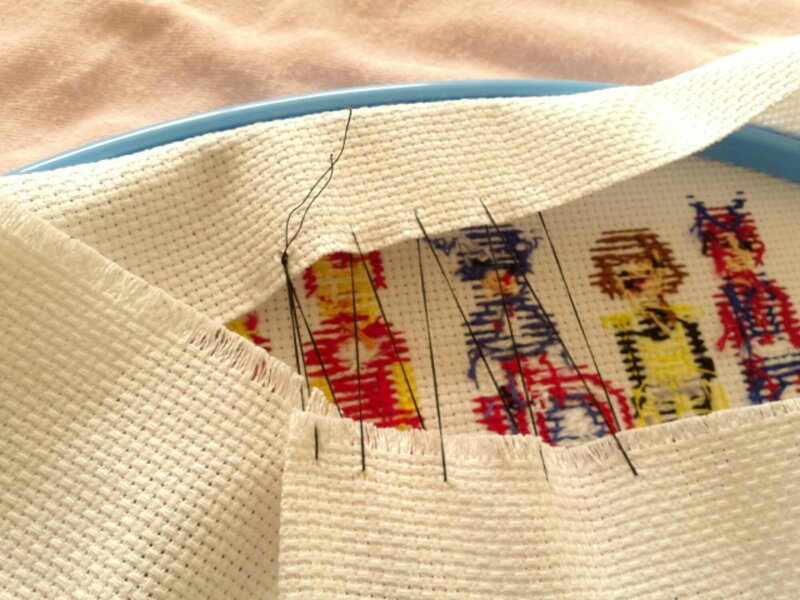 You end up with a Frankenstein monster type stitching that will keep the fabric taught and secure. Ta-da! A work suitable for your wall. 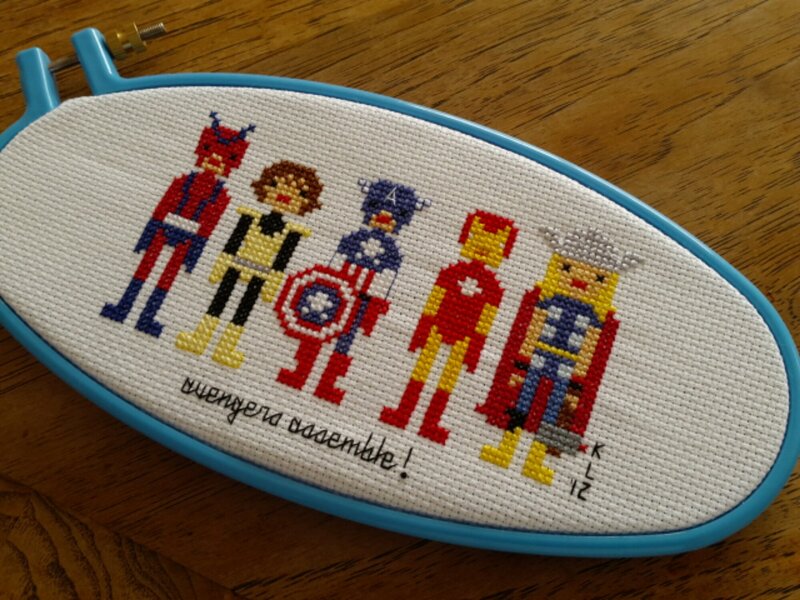 :-) This is the free Avengers patterns from the Wee Little Stitches blog. I used DMC glow in the dark tfloss for Iron Man’s eyes and chest. 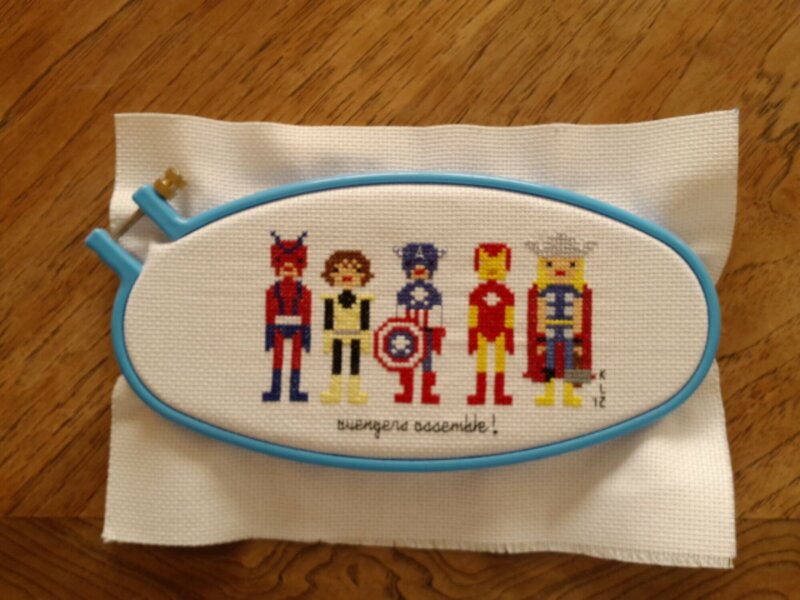 I used silver rayon DMC thread for Thor’s helmet and added a hammer for him (the original doesn’t have one). I also changed Wasp’s outfit colors to match the cartoon version we like. 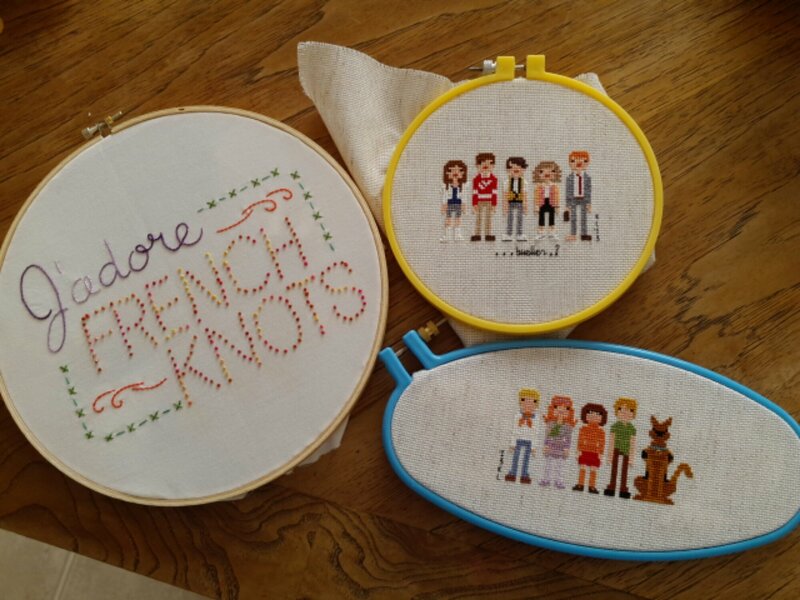 I have three more to finish today, plus two that need more attention because they don’t quite fit in the hoops. I’ll go over that hack later. Have fun! Display those stitches! 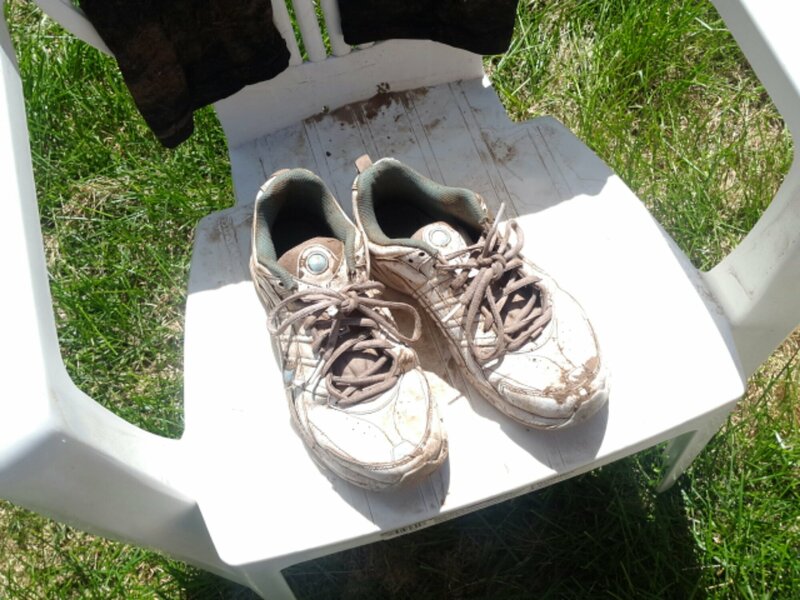 It was a perfect day for getting muddy. I had a busy summer. Who knew they got that busy when you are the parent, not the kid? Remember being bored? Anyway, I have taken to drawing on my oldest’s snack bags. It’s too fun. I saw it online, so I won’t take credit for the idea, but it’s silly and he just loves it! Robots are fun to draw. 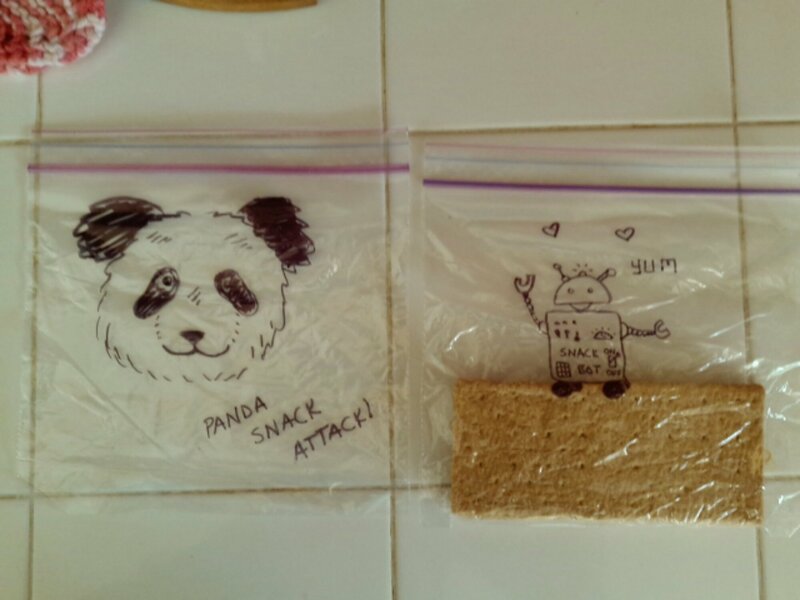 The panda kind of looks like the one on his snack bag. *sigh* He started kindergarten this year. I want to draw silly things for him as long as possible. The grahams are for tomorrow’s snack. The panda bag had apple slices in it today, if you are curious. His school is close, so we walk everyday. Some days I have time to ride my bike or run, which is really awesome! 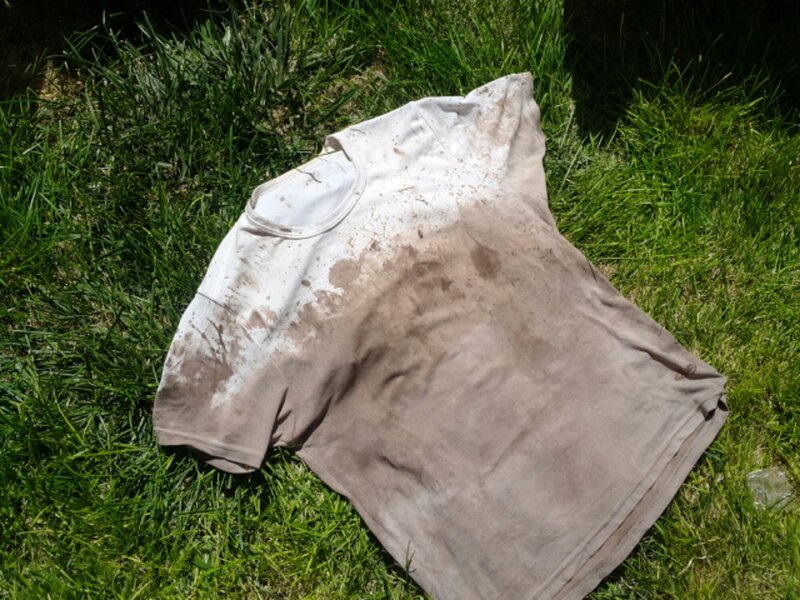 The Dirty Dash is next weekend, so I’ll probably post some before and after pictures, as in clean vs dirty and also last year vs this year. This weekend (starting tomorrow!) Is Bubonicon 45, the local sci-fi/fantasy convention. My friend and I have a booth, something we have talked about for a long time, finally realized. I am super excited and a little nervous but mostly excited! We’re already talking about next year. I’ll post more about the con after I get some good pictures. I will be bringing my sketch book to practice. It seems I found my art vein again, and it’s so fun. 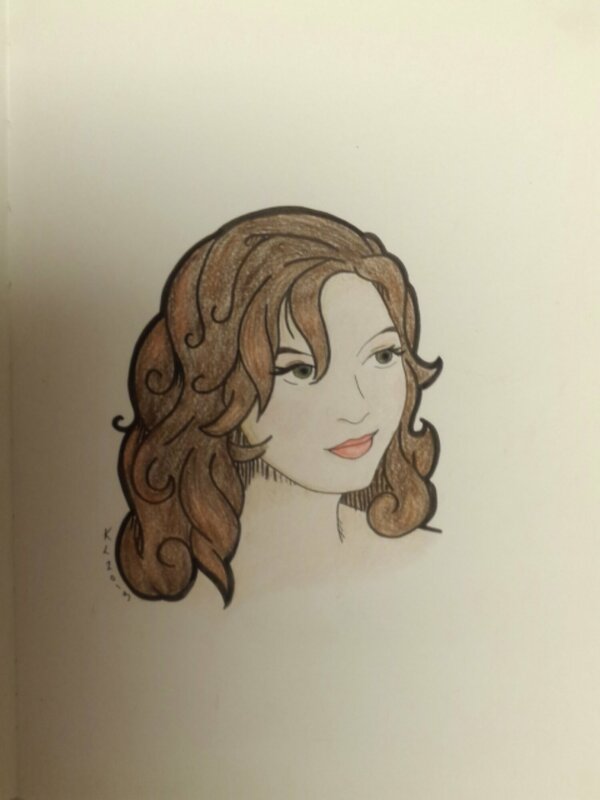 I’m happy with how it came out, especially in color. She thinks it makes her look like a Disney character, which is awesome! I love Disney artwork,especially Marc Davis. That’s the kind of direction I’m aiming for. Simplistic, minimal’ bright colors, expressive…just artsy fartsy fun stuff, you know? It’s an amazing feeling to have the drawing look the way it does in my head. Who knows? Maybe I’ll have a comic on this blog someday. I want to finish this WIP in 2013, so help me. My aunt and uncle’s 50th anniversary is in 2015 and I’d like to get it sent to them before then. So here is a picture of my progress. Not much, but I’m getting much farther on the windowsill. I make notes on my patterns. 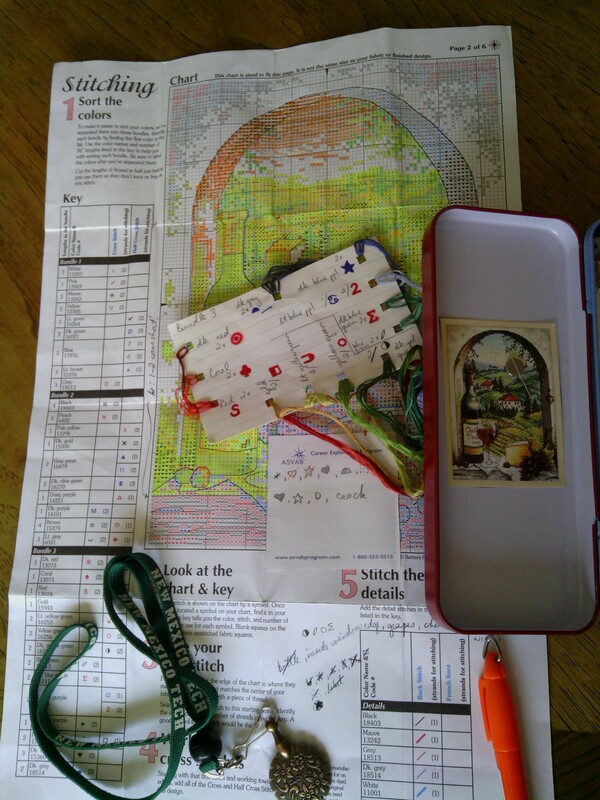 I like to plan out parts of the whole to make it easier to know what to stitch next. I’ll get the grapes and cheese after the window for sure. I like to even list which symbols are next so I can keep on truckin’. Note the reference pic on the tin’s lid. It’s nice to see that my project is looking the way it is supposed to. I love it when it starts to come together! My plan today is to sit around as much as possible and stitch and crochet. Hope you are enjoying your weekend too!